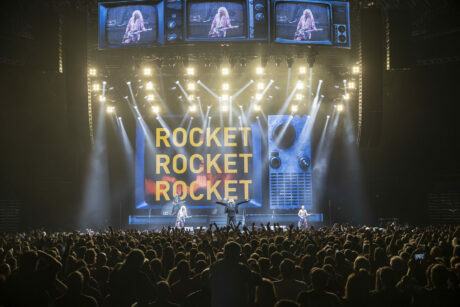 UK – Rock legends Def Leppard continued their 2018-19 “Hysteria” tour in UK and Irish arenas just before Christmas, celebrating 31 years since the release of their seminal Hysteria album, which was played in its entirety in track order, reaching out to their many fans – original and new. 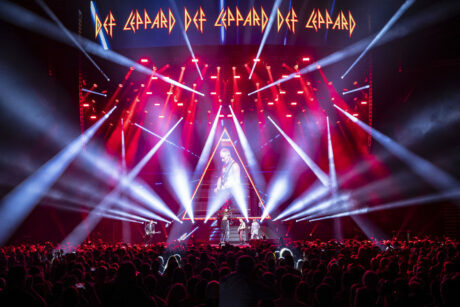 HSL supplied lighting equipment plus rigging – with over 100 motors including a 25-way Kinesys automation system – to the tour which features a striking lighting design by Kenji Ohashi. He’s lit the band for the last 17 years, helping to ensure that they look every bit the rock heroes – formed in Sheffield in 1977 – and as awesome today as they did 30 years ago! 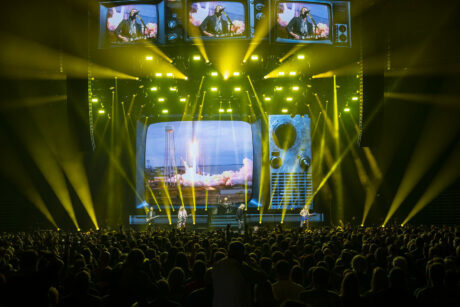 The lighting and rigging – which also included supplying motors for video and PA – was co-ordinated for HSL by Jordan Hanson, who comments that they “were delighted to be back working alongside production manager Chris Adamson and ‘universal’ lighting crew chief Kevin Cassidy again. It was really interesting to see Kenji’s work and the vitality and energy his lighting brought to a great looking and sounding production”. Kevin Cassidy, together with his two touring technicians, Kinesys operator Christian Alvarado and Calvin Mosier who looked after their touring Follow Me remote spotting system, went to HSL’s HQ in Blackburn to prep the gear ahead of the three week tour. 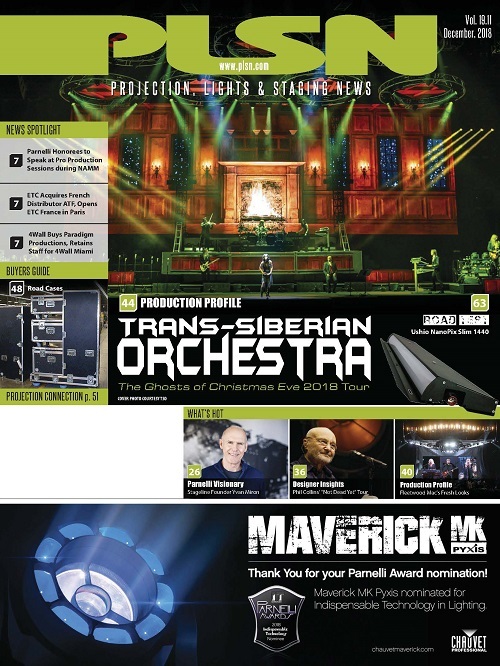 They were joined on the road by four technicians from HSL, crew chief Dave Dickinson, FOH and systems tech Tim Dunn, moving light tech Tom Soltan and Andy Whitt who looked after dimmers. Rigger Ian ‘Tuffy’ Bracewell was also working via HSL. Like any self-respecting ‘metal’ band, there was a steelyard of trussing and metalwork in the roof which provided lighting and video positions as well as an architectural element to the performance. There were five straight runs of trussing, three of which were each split into three sections with all nine of these moving on the Kinesys system to create a range of different imposing structural looks as the band powered through classics like “Armageddon It”, “Animal” and “Pour Some Sugar on Me”. All the trussing was HSL’s pre-rig and populated with six main types of fixtures. The primary wash fixtures were Vari*Lite VL3500 Wash FXs and the main profiles were Claypaky Scenius Unicos (with the shutters), and these were joined by CP Sharpies for the beams, GLP JDC1 LED strobes, CP A.leda 20s with B-Eye lenses for additional washes and soft key lighting… and, naturally, shed loads of blinders which were CUEPIX Blinder WW4s from Elation. Amounting to over 200 fixtures in total, these were densely populated on the trusses, and on the floor were another 12 x Sharpies and 12 x Martin MAC Viper Profiles. 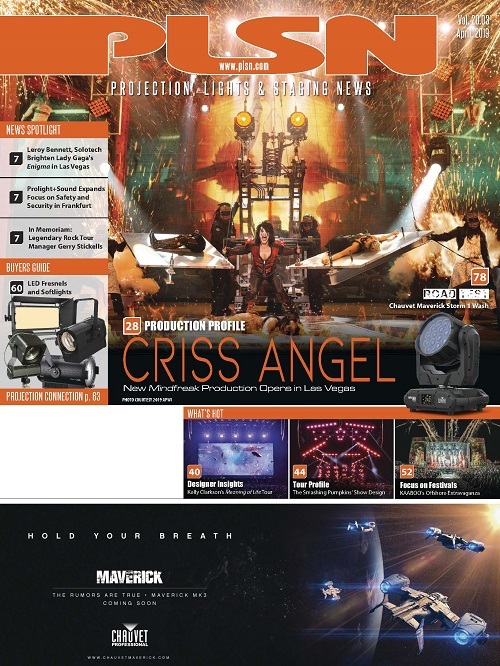 In addition to these, ten Robe BMFL Spots rigged on their own truss were utilized as follow spots, all run via five operators – positioned side stage – using the Follow Me control system. 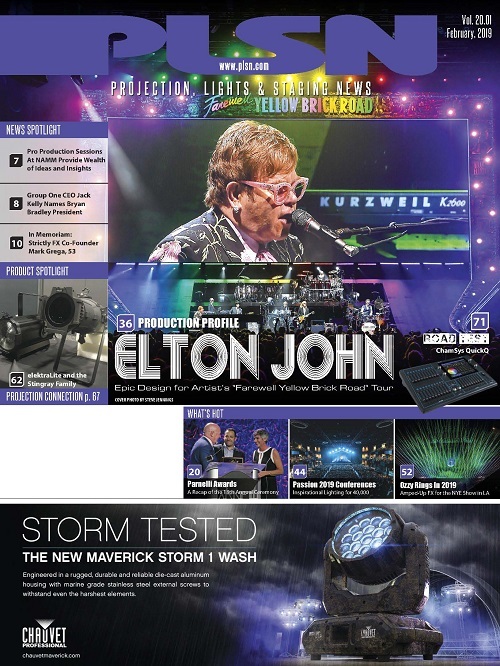 The operators controlled the pan/tilt parameters of the spot movement – with two BMFLs assigned to each band member, while Kenji had control of iris, colour, dimmer, etc., through his grandMA console which was running multiple protocols including MANet and SACN as well as ArtNet for the Follow Me system. In addition to the large upstage LED video screen supplied by Stageworks, a front ‘crown’ screen was flown downstage which came in as a mask during the changeover from opening act Cheap Trick. 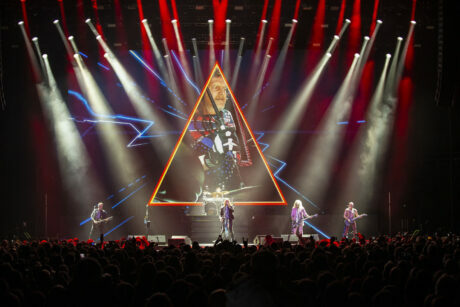 As Def Leppard started their set, this slowly rose up to trim height to form a header for the show, receiving both the IMAG/camera mix which was directed by Chris Keating, and colourful, eye-catching playback content, all working in unison with the images on the upstage screen. All the trussing and screen movement was achieved utilising a mix of one and half-ton motors with Kinesys Elevation 1+ drives and Vector control. They also use Kinesys in the US where the vendor is Upstaging. 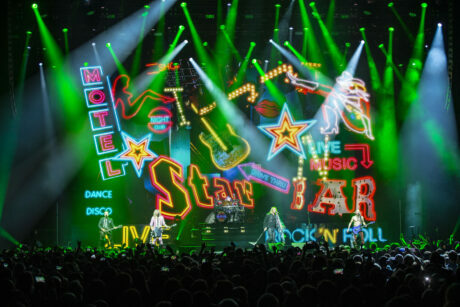 The automation elements of this design emanated from a US co-headliner tour by Def Leppard and Journey, for which the stage/lighting design was a collaboration between Kenji and Kevin “Deuce” Christopher. Everyone liked it, so it stayed as part of the production design. Kenji’s lighting treatment makes an already substantial rig look even bigger. He has all those sumptuous big rock looks that you’d expect, delivered with his own nuances and finesse, which keep everything clean and clearly defined, with sharp, distinctive colours and combinations, sometimes almost minimal to keep elegance and power paramount. 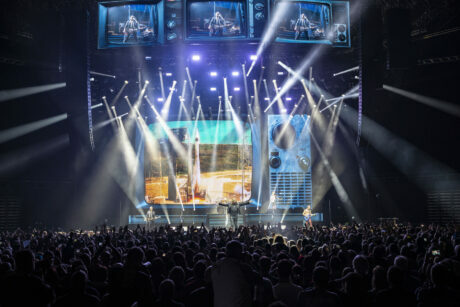 This ‘big rock show’ lighting with a touch of art house has many layers of depth and richness that keep revealing themselves as the set unfolds with a succession of rock anthems. His timing is incredible… if you didn’t know otherwise, you would think it was timecoded, and – so the crew reveal – Kenji is consistently cue-perfect show to show. The main challenges for the lighting crew came with the accuracy of the rigging requirements and getting all the moving parts in exactly the correct places at each venue. Also, to accommodate the LED ‘crown’, they needed to achieve a maximum trim height each day… so the rigging mark up at the start of the get in was a major task for Dave and the experienced HSL crew. 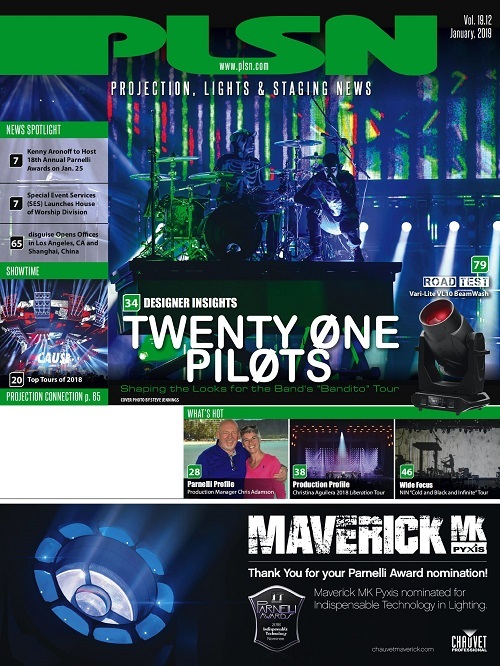 The upstage screen was hung on seven 2-tonne motors, and the L-Acoustics PA took 24 motors alone. Audio was supplied via a combination of Sound Image kit from the US with racks-and-stacks from SSE in the UK. Sound was mixed with studio-perfect precision by FOH engineer Ronan McHugh. Kevin Cassidy started with the tour earlier in the year – he and Chris Adamson go back a long way, and in particular working for Tom Petty, with Kevin clocking up 27 years for the late artist, latterly as his creative director and co-LD. 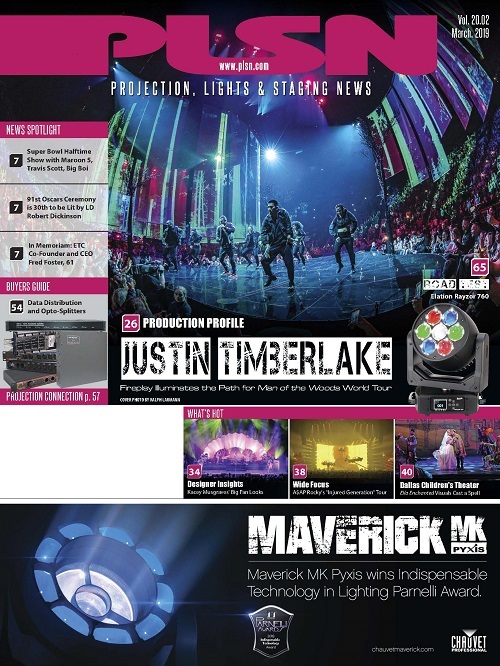 Both he and Chris have also worked with HSL before, most recently on John Mayer’s 2017 tour, and having received such “fantastic service and support” on that, they came back and asked HSL to deliver the lighting and rigging package on this. Kevin adds: “In the grand scheme of things, most companies can provide the same equipment, so ultimately it comes down to the people. Simon and Jordan provide a great service in a very positive environment”. This UK and Irish leg of the tour was finalised quite rapidly in a short timeframe, and Kevin commented that Jordan and the team at HSL were “super helpful” with the many small as well as all the larger details. “I really appreciate the hard work and efforts by HSL, they are great people to work with, the kit is in good condition and nothing is ever too much trouble”.